The capital of India, Delhi, is the third largest city of India. A fusion of the ancient and the modern, standing along the West End of Gangetic Plain, Delhi, revels a picture rich in culture, architecture and human diversity. It has rich history, monuments, museums, galleries, gardens and exotic shows, truly representing India. Delhi comprises of Old Delhi and New Delhi, both very different from each other but providing a rich blend of past and the present to this capital city of India. The city is strewn with pieces of Mughal and British architecture. Delhi has many hustling and bustling bazaars, where you can find all sorts of goods and items. The city is well-planned, there are trees that line the spacious streets and imposing buildings that reflect the progress of the city. 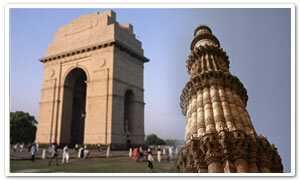 Visit Delhi and experience a fusion of power, politics, invasions, and conquests & of free India. It is one of the most enchanting cities in the world, luring visitors from every corner of the globe to explore and discover the exotic culture which still flourishes along the flows of development. 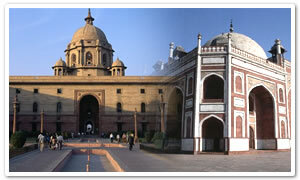 It is one of the prime attractions in Delhi, it is regarded as bequest of Islamic culture in India. It also represents the military might of the Turko-Afghan Salve Dynasty ruling India during the 12th century. This 73 meter-high-tower is believed to have been built in 1193 A.D. by King Kutub-ud-din-Aibak to celebrate the victory of the Afghan invader over the Rajputs. Its five stories are graced with fine sculptures made of sand stone. At the foot of the tower, there stands a Mosque which was built in 1197. The tower was repaired for several times due to the earthquake and lightning. 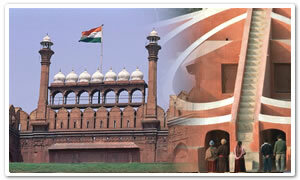 Lal Quila or the Red Fort is one of the elegant structures in Delh. It lies on the riverbank of Yamuna, surrounded by a wall of about 2.4 km in circumference and built of red sandstone. The construction of the Fort began when the Mughal King Shah Jahan transferred his capital from Agra to Delhi and was completed in 1648. The highlighted structures include the Diwan-e-Am (hall of public audience), the Diwan-e-Khas (hall of private audience). Besides this is the Rang Mahal, the water-cooled apartment for the royal ladies. In the basement of the fort is a market where several traditional Indian goods can be purchased at nominal rates. The Red Fort also has light and sound in the evenings. Built in the 16th century as a memorial to the Mughal emperor, this enormous piece of architecture is said to have inspired Emperor Shajahan to construct Taj Mahal in Agra. The tomb was built to dedicate to Emperor Humayun by his widow, Haji Begum in A.D. 1565. The tomb was made of red stone, crowned with the gorgeous marble dome. India Gate is Located at the end of Rajpath in New Delhi.Designed and built by the British architect Lutyens, it was originally called "All India War Memorial" in memory of Indian soldiers who died in the campaigns of World War I, the North-West Frontier operations and the 1919 Afghan Fiasco. Names of the martyrs are inscribed on the walls with the eternal flames honoring them. Rashtrapati Bhavan is the official residence of the President of India. It is the former the residence of the Viceroy during the British Raj. Perching on the magnificent Raisina Hill, the grandiose building comprises 340 rooms for several functions. Visitors wishing to visit the building are supposed to contact the deputy Military Secretary to The President are allowed to visit the Durbar Hall, Ashok Hall, the Dining Room and the Mughal Gardens only. The Ghats along the banks of Yamuna River are marked by memorial places where the leaders and freedom fighters of India were cremated. The most visited among them is Raj Ghat where the father of the nation, Mahatma Gandhi was cremated after his assassination in 1948. Within the premises there are cremation grounds of Jawahar Lal Nehru, Indira Gandhi, Sanjay Gandhi, Rajiv Gandhi and Lal Bahadur Shastri also. 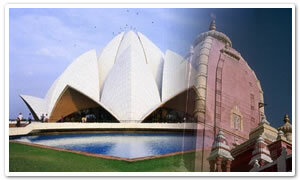 Built by G. D. Birla, the industrialist, Laxmi Narayan Temple is known also known as Birla Mandir. One of the most worshiped Hindu temples in India, it is located in the west of Connaught Place, the temple is devoted to Lakshmi, the Goddess of wealth and God Vishnu, her spouse. After six years of construction, the temple was inaugurated in 1939 by Mahatma Gandhi, and for the first time, the temple was opened to people of all castes, no exemption for the untouchable caste. Bahai temple built in 1986, is also known as the Lotus temple because of its lotus shape which reaches a height of more than 40 meters. The temple belongs to the Bahai House of Worship, dedicated to the oneness of all religions and mankind. Iskon temple is complex of temples dedicated to Lord Krishna and stands on the Hari Krishna Hill at a height of 90 feet above ground level. It is decorated with attractive paintings of Russian artists, depicting stories of legendary personalities of Ramayana epic like Ram, Sita, Laxman and Hanuman. Performances of traditional music are also displayed every Sunday. Chandni Chowk, situated in Old Delhi, literally means Moonlight Square. It is a pack of bazaars, where the colorful lifestyle of Delhi can be seen. Here one can buy anything and everything ranging from fish and poultry to second-hand items, gems and gold, garlands, turbans, and spare car parts. Located within the area of the Connaught Palace, the stone observatory of Jantar Mantar was built in 1724 by Maharaja Jai Singh, who later built the others on the same lines in Jaipur, Ujjain, Varanasi, and Mathura. It used as the observatory, boasted for its accuracy in calculating the astronomical movements.